A yacht stewardess on laundry duty. Thanks to Kate Chastain for submitting the great photo! 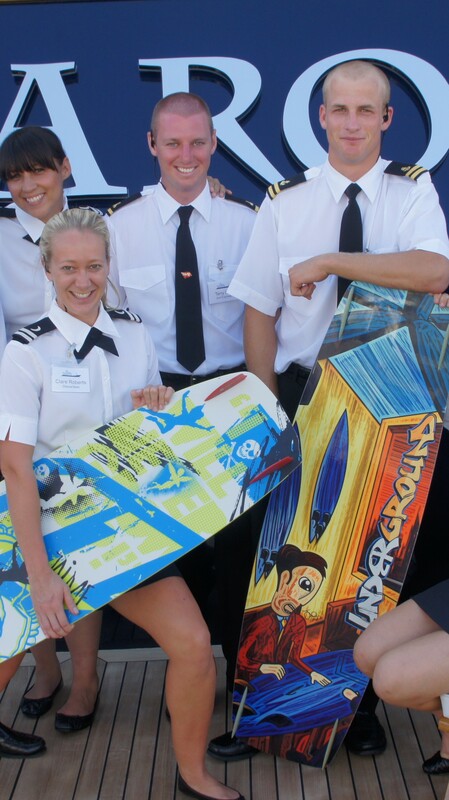 I Must Confess… I never would have expected I’d become a yacht stewardess. I’m a born-and-bred Midwestern girl from Indiana, and I began life marching to the same drummer as most of the people around me. My idea of a successful life was doing well in school and getting a good job—well, actually, getting a GREAT job (in a “keeping up with the Joneses” sort of sense…with a briefcase to match). I finished high school at the top of my class and entered Indiana University, determined to come out four years later bound for law school or some high-powered corporate position. But during my final year in college, while taking a schedule of both English Literature and Philosophy courses, I became inspired to seek a more unique route than just the safe and secure. Ancient Greek philosophers were encouraging me to question everything around me, to look for answers beyond the obvious, and to step out of my “cave” and seek a more enlightened perspective on life. The brave works of bohemian Modernist writers were inviting me to get out and explore the world and to travel to far-off places, namely Europe. As I contemplated these messages, I realized I had fallen into the habit of defining my career goals based upon what others expected of me. My life felt generic, and I yearned for a more adventurous path. I even began to question the motives behind my plan up until then: Who was I, I wanted to know, away from the things that defined me—my family, my friends, my academic record? I ended up graduating Phi Beta Kappa (a national academic honorary society) with two degrees… but when it came time either to submit my law school applications or to interview with the Procter & Gambles of the world, I passed on both. Instead, I decided it was time to do a little soul-searching. I yearned to be an “American in Paris,” to lounge around the fashionable ports of the Côte d’Azur (the South of France) like Hemingway and Fitzgerald, or to be Down and Out in Paris and London, as George Orwell had once done. Bottom line… I wanted to travel! First I went to England under the auspices of a six-month work abroad program. I spent four months struggling to make ends meet in London, working for a marketing firm (because it would look good on my résumé when I got back to the States—old habits die hard, you know). I had a tough time admitting it, but I was miserable. This was just not the adventure I had imagined. I was playing it too straight and narrow and not getting what I could out of my short time living abroad. One day, a total stranger—the sort of character few Midwestern mothers would want their daughters taking advice from—approached me on the street (literally, out of nowhere) and told me to “take a leap in the dark and never look back.” I was open-minded enough and romantic enough to listen: I quit my job the next day and hopped a bus to Edinburgh, Scotland the following week. Once in Edinburgh, I was left with only £7 to my name. I lived in a hostel (inexpensive, dormitory-style accommodations) for a short time, working the front desk in exchange for room and board until I could afford a flat. To survive the next five months, I managed to find and juggle three jobs (bartending, waiting tables, and telemarketing), and I actually overstayed my work visa by an extra three months. It was struggle, it was strife, it was a game of survival in a foreign environment—and I loved every minute of it! In the end, I had managed to save enough money to finish my year abroad backpacking through Europe—14 countries in under three months. Talk about a rite of passage journey! Back home in Indianapolis, I realized that law school was no longer something I wanted to pursue. I felt I’d seen something on that other continent, and I wanted to go another round. Oh, I pretended like I was ready to get serious about finding a “real job” (as my parents would put it): I enrolled in an advertising course, signed on to run a few local political campaigns, and swore to my mother that I was researching the market for PR jobs. Opportunity knocked the day I was scheduled to interview for a coveted position with a national political party’s office in Washington, D.C. A friend of mine from high school called and asked me to come to Florida. 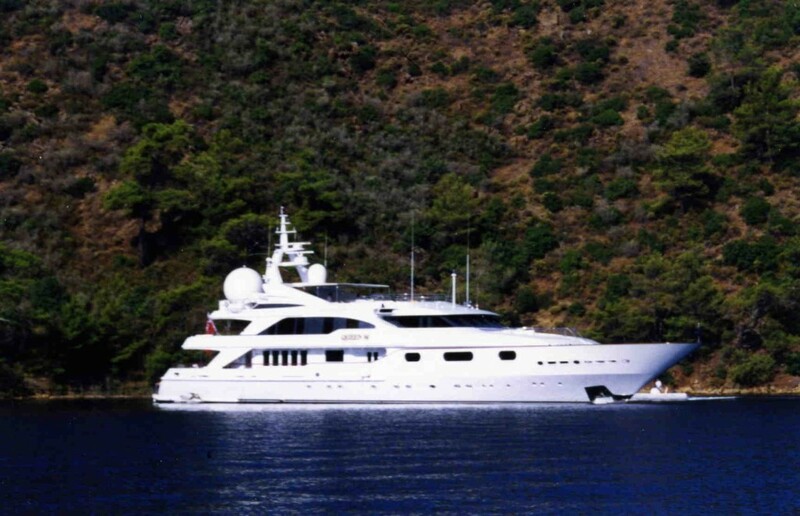 He was the captain of a luxury yacht, and a position had just come open on his crew. He wanted me to come work for him: as a stewardess. If it weren’t for my friend Carl, who entered the yachting industry straight out of high school, I never would have known about this business. In fact, even with that connection, I was still pretty clueless about what I was setting off to do. Carl and I grew up together. His dad had worked in the yachting industry for years, as a captain and later as a yacht-charter broker based out of Indianapolis. While my friends and I all knew that, we still had little clue what it meant exactly. We just knew to call him “Captain Ted.” And boy, did Captain Ted have great travel stories. When we graduated from high school, Carl followed in his father’s footsteps by heading off to Fort Lauderdale to obtain entry-level work as a deckhand in yachting. There again, my friends and I thought, “Okay, sure, whatever that means.” During the years I was slaving away in college, Carl used to come home from places in the Caribbean and the Mediterranean with tons of crazy stories about working aboard these “palaces on water.” He would tell me how he was working on this classy boat owned and visited by some really big-named people. But that wasn’t the crazy part. What blew my mind was his exact job function. 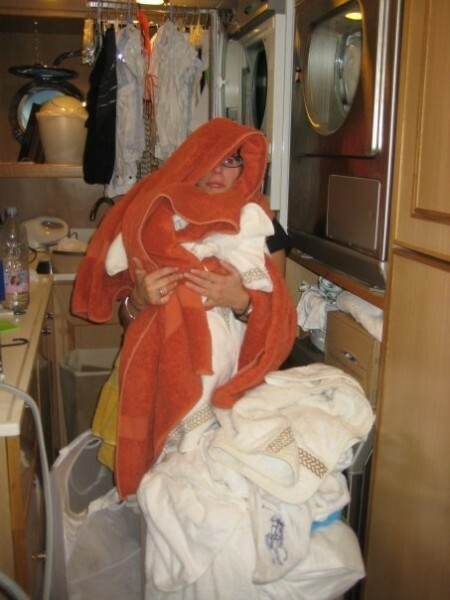 Members of the deck crew on M/Y Cloud 9. Photo courtesy of Suki Finnerty, YachtingToday.TV. That’s where it got really crazy. Not only was Carl getting paid a salary, but that money he made was never really touched; it just went straight into his bank account and sat there because he made enough income in TIPS to live off that money alone! Crazier still, he had no living expenses: no rent, no utility bills, no car payment. Even his meals and basic toiletry items were provided. Over the course of the next three years, Carl worked his way up from entry-level deckhand to a more experienced deckhand and to a licensed first mate. And by the age of 22, he became one of the industry’s youngest yacht captains, taking command of a 114-foot megayacht and sailing it all around the world. I always thought it sounded too good to be true. So years later, when he called up inviting me to come work for him—to serve rich people food and iron their underwear while they vacationed on these glamour vessels—I knew it was something I had to consider. As it turns out, the job with Carl didn’t come to fruition. He needed a stewardess by the following week, and I had too many loose ends to tie up before I could leave. He hired someone else. Carl had planted a seed. For the next several weeks, I could not stop thinking about all the extraordinary adventures I might experience working as a luxury yacht stewardess. I would wake up in the middle of the night and start researching online all the places yachts travel. I even began analyzing my bank account, trying to determine how much money I could scrounge together to get my air ticket to Fort Lauderdale and support myself while I looked for a job. Yes, despite my reservations, something was working deep down inside, and like a wave on the sea, it gathered momentum before hitting me full force with a message that was nostalgically familiar: Take a leap in the dark and never look back. Within three weeks, I had turned down the interview opportunity in Washington, moved out of my apartment, sold my car, and moved every item I owned into my father’s basement. The next thing I knew, I was on a plane to Fort Lauderdale instead. I was off to become a yacht stewardess! But Carl was right. One month, a five-day, intensive stewardess training course, and a handful of interviews (all arranged by some very helpful crew recruiters) later, and I landed a job on a 164-foot mega-yacht owned by a European billionaire. It would be chartered out for $25,000 per day, which would mean that our 10-person crew could make between $1,700 and $3,500 per person in tips on a week-long charter (on top of a healthy salary). I’d be one of only two Americans on-board this colossal cruising castle as we sailed to chic ports throughout the Caribbean and Mediterranean, catering to some of the most powerful individuals in the world. As you can imagine… I never looked back. 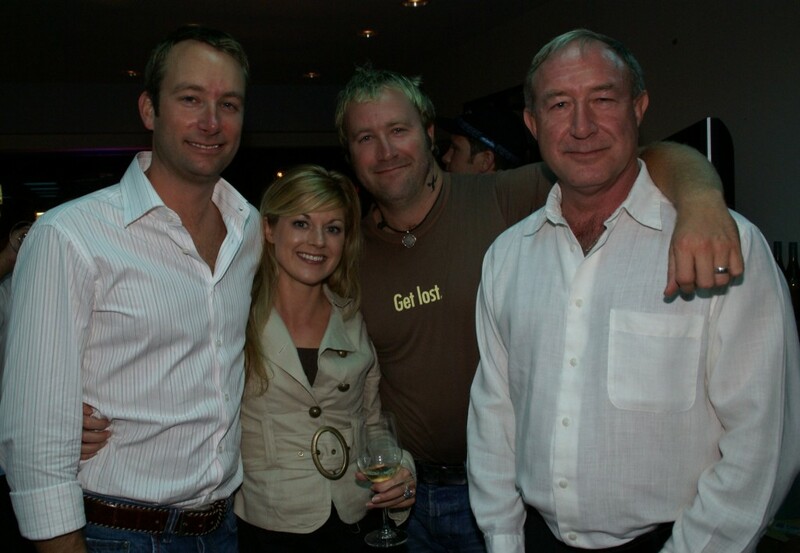 Author Julie Perry with her friends Captain Carl Sputh, Captain Ryan Sputh,and Captain Ted Sputh — at the book launch party for “The Insiders’ Guide to Becoming a Yacht Stewardess” in October 2006. Please feel free to download Chapter 1 here. Why wait to get started! Author’s Note: Portions of this Preface originally appeared in the May 2003 issue of Indianapolis Monthly magazine, in an article entitled “Cabin Girl: Confessions of a Hoosier Turned Yacht Stewardess,” co-written with Megan Fernandez.